As the protege of cartoon voice legend Daws Butler, veteran award-winning broadcaster Joe Bevilacqua is no stranger to the cartoon world. From Mel Blanc to June Foray, from Disney to Hanna-Barbera, Cartoon Carnival is a lively hour of rare and classic cartoon audio, children's records, cartoon music and sound effects, new radio cartoons, interviews, and mini-documentaries about the wonderful world of animation. Just a small sampling of the delightful characters you'll encounter in this must-have audio includes Yogi Bear, Huckleberry Hound, the Flintstones, Quick Draw McGraw, Rocky and Bullwinkle, Popeye, Bugs Bunny, and Daffy Duck. There's fun for the whole family! Included in this first collection are interviews with Joe Barbera, Leonard Maltin, Bob Clampett, Stan Freberg, Daws Butler, Mel Blanc, Bill Marx, June Foray, Bill Scott, Hoyt Curtin, and Craig Marin. Also included is audio from Warner Brothers and Hanna-Barbera cartoons such as The Jetsons, The Flintstones, Huckleberry Hound, Yogi Bear, Quick Draw McGraw, Ruff 'n' Reddy, Magilla Gorilla, Bob Clampett's Time for Beany, Jay Ward's Rocky and Bullwinkle, Fractured Fairy Tales, Fractured Flickers, The Chuck McCann Show, Winchell-Mahoney Time, and The Sandy Becker Show. 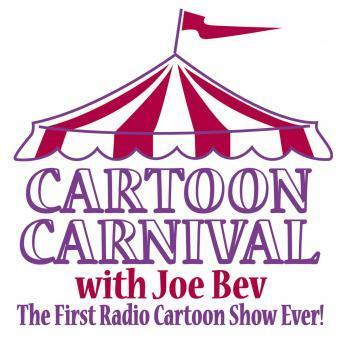 The Best of Cartoon Carnival, Volume 2 contains over ten hours of cartoon characters celebrating President's Day, Valentine's Day, Father's Day, Mother's Day, Halloween, Thanksgiving, Christmas, and more. From Mel Blanc to June Foray, from Disney to Hanna-Barbera, Cartoon Carnival is a lively hour of rare and classic cartoon audio, children's records, cartoon music and sound effects, new radio cartoons, interviews, and mini-documentaries about the wonderful world of animation. The thirty rare and restored audio cartoons in this collection feature such beloved characters as Yogi Bear, Huckleberry Hound, Pixie & Dixie, Jinks, Quick Draw McGraw, Top Cat, Rocky and Bullwinkle, Dudley Do-Right, Popeye, Daffy Duck, Bugs Bunny, Cecil Tortoise, Yakky Doodle, Woody Woodpecker, Uncle Dunkle and Donnie, Punky Possum, and Courageous Cat and Minute Mouse. The wonderful cast includes Joe Bevilacqua, Lorie Kellogg, June Foray, Corey Burton, Matt Hurwitz, Daws Butler, Don Messick, Doug Young, Chas Butler, Lee Harris, Nancy Cartwright, Mel Blanc, and many others.